After initial claims by police that stabbing of principal in Lod was criminal in nature, Shin Bet announces arrest of terrorist responsible. 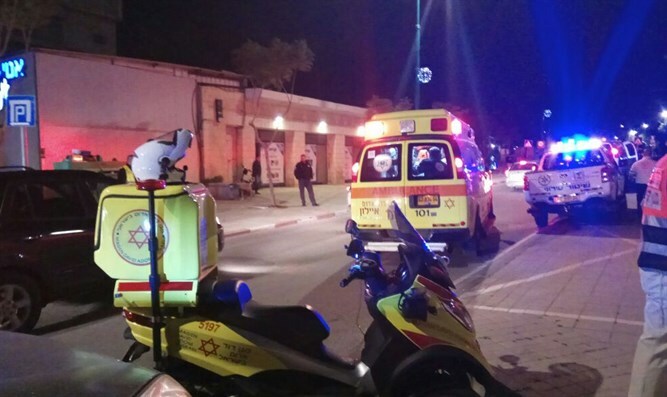 The Shin Bet announced Monday afternoon the arrest of the Arab terrorist who stabbed a school principal in the city of Lod last week. The police had claimed at the time that the stabbing was criminal in nature. However, the attacker admitted to carrying out the stabbing for nationalistic reasons after his arrest. The terrorist, Malik Bassem Isma'il Sa'ada, a resident of Halhul, a PA town near Hevron, told the Shin Bet that he had taken a knife from the bakery where he worked without a legal permit, and sought a Jewish woman as a victim in a pre-planned attack. He said that he had first attempted to stab another woman in a parking lot, but was not able to before she entered a nearby building. He later noticed a woman with a head-covering in the parking lot. When he realized that she was Jewish, he decided to attack her. He approached her and pulled out the knife. The victim, Revital Kenino, ran away, but the attacker pursued her and stabbed her. He then fled the scene. The terrorist was arrested while trying to return to his village. Langfeld noted at the time that security officials were still refusing to say that the attack was a terror attack. “Unfortunately, police and security officials are not ready in the meantime to say it outright, even after the family and other officials honored their request to wait until the stabber was caught. We will act in every possible way so that police admit the truth about this occurrence as soon as possible.” The Shin Bet announcement made that admission superfluous.